I arrived at the concert early and watched the soundcheck through a window. I decided to walk to the back door, hoping someone would come after me. Someone did, so I told them my name and that I help Pete Walton a little with chairpage. 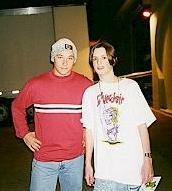 I said I was wondering if I could meet silverchair. So he said he would see what he could do. Thirty minutes after Handsome and Local H played, it was time for silverchair. They played the opening circus music, then the lights went out as silverchair came on stage. They started with Slave -- it was very loud and awesome! Next was Roses, Findaway and Abuse Me. and so on! The mosh pits were very big. One guy was kicked out for picking a fight and being too wild and drunk. The last song was Israel's Son and it was awesome. As people started to leave I went to the box office where I'd been told to go after the show. The guy I talked to earlier told me to follow him and I waited for him as he went backstage. He returned and said I would be able to meet the band when they came out to go to their buses. While I was waiting I realized that I didn’t have a camera, so I had my sister's friend run back to the car and get one. We waited some more and finally Chris came out. He autographed my frogstomp cover and posed for a picture with me. Ben came out and signed the cover as well. I asked him if he knew Pete Walton and he said yeah, so then I told him that I help Pete a little on chairpage. "You do?" Ben said, and I said yeah, and he was surprised! While I was talking to Ben, Daniel had come out of the door and walked around us. I asked Ben if I could have Daniel's autograph, and Ben said yeah and whistled real loud and yelled "Johns!" Then Daniel turned around and said "What?" Ben signaled him to come over. He did and I asked him for his autograph and he said sure and then Ben told him how I help Pete Walton a little with the page. "Really?" Daniel said. He signed his frog and he said thanks for helping. I asked if I could have a picture taken with them and Daniel said sure! We posed and Ben was turned around talking to someone else, so Daniel hit him on the back to turn around! He did and we posed for the picture. Daniel flipped off the camera! They were ready to leave so Daniel said thanks for everything. It was so cool! They left and it was the best day of my life. 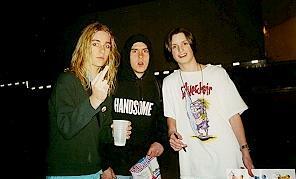 silverchair was so nice! They are bunch of nice guys, and I owe all the thanks to Pete or I would never have met them!